Michael Noonan says attempts will be made to impose significant losses on bondholders at Anglo Irish Bank and Irish Nationwide Building Society. 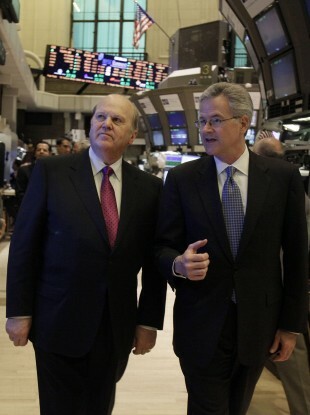 Wall Street: Michael Noonan is escorted around the trading floor of the New York Stock Exchange. THE MINISTER FOR Finance Michael Noonan has announced plans to try to burn senior bondholders at Anglo Irish Bank and Irish Nationwide Building Society. Noonan is in the US for a four day trip, and today met with IMF officials and the US Treasury Secretary Timothy Geithner reports RTE. The minister says that Ireland will seek to impose losses on the senior bondholders at the two financial institutions, targeting around €3.5 billion in bonds issued. He says the IMF supports the strategy, and has called the two banks “warehouses for bad debts”. Noonan also says that Geithner has agreed to support efforts to cut Ireland’s bailout interest rate. The minister has told US news media that Ireland’s corporate tax rate is not up for negotiation, and that Ireland would rather pay a higher interest rate. He said that the Irish were “not for turning”, reports The Irish Times. Email “Finance Minister announces plans to try to burn senior bondholders”. Feedback on “Finance Minister announces plans to try to burn senior bondholders”.